This Couple Has Been Together 68 Years. As well as sorrow in this powerful photograph, we also bear witness to the depth of love and commitment from two people who shared their lives together over such a considerable span of time. my great grandparents had that kind of love and it always inspired me to find the same. I love seeing that in older couples to this day and i hope I can have that wtih my husband now. Its rare in today’s society and still so nice to see it. Thanks for sharing. 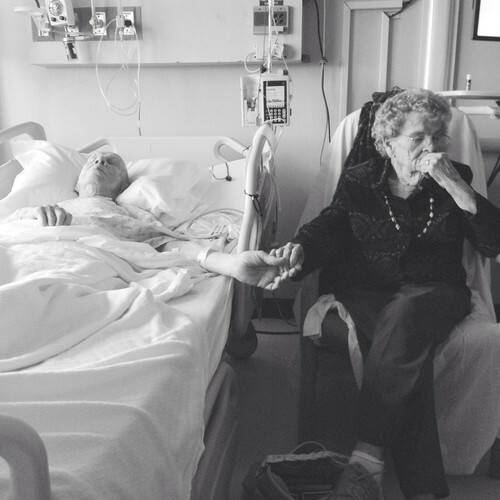 I can so relate to this photo,it makes me think of my grandparents, my pop cared for my nan who has alzheimer’s till he became too ill to do so, he has now passed and she is is a nursing home. It is a rarity, to see someone who’s been together for so very long, and still stay true to their “’til death” vows. it’s what love and commitment is all about.